Would you ride in a Ferrari with no windshield? Ferrari hasn’t yet publicly announced a price for the new car, though speculation runs between $2 million and $3 million. At first glance, they look like something you’d find at a vintage car rally – and that’s no surprise, since Ferrari is intentionally turning the clock back more than half a century with the design of two new models that debuted at this week’s Paris Motor Show. But while the near-twin Monza SP1 and SP2 supercars might look retro, they’re decidedly modern under their carbon fiber skin, sharing the fastest V-12 engine Ferrari has ever offered, one capable of hitting 125 miles an hour in under 8 seconds. The two Monza models are part of a new operation the Italian automaker is launching. Dubbed Icona Ferrari, it will focus on bringing back to life classic design concepts from the brand’s past. It’s part of the new strategy Ferrari has launched since the company went public in 2015, adding a variety of new models to help boost demand. That said, the Monza cars will definitely qualify as exclusive, with plans to build only 499. And Ferrari says it will only be selling them to its “best customers and collectors,” meaning that you’ll have to keep fingers crossed and wait for an invitation if you hope to get one. The two new Icona models are largely identical - though, as the name suggests, the SP1 can hold just one person and the SP2 makes room for a passenger by eliminating the tonneau cover. The super-light and ultra-strong carbon fiber bodies replace the hand-rolled and hammered aluminum that was the norm among exotic automakers in the years after World War II. That reduces weight, improves performance, and improves safety. One of the more unusual features is the lack of a windscreen on either Monza model. Instead, the supercars rely on a new concept that Ferrari is calling a “Virtual Wind Shield,” which uses aerodynamic tricks to route air around occupants. Both cars share the same naturally aspirated 6.5-liter V-12, which blasts out 809 horsepower to the rear wheels. That is, notably, 20 more prancing ponies than in the current performance king in the Ferrari line-up, the aptly named 812 Superfast. The oversize headrests in the Monza cars will clearly be necessary, as the SP1 and SP2 are both rated to hit 60 in a mere 2.9 seconds, while it takes just 7.9 seconds to go from a dead start to 125 mph. That’s the sort of performance drivers could only have dreamed about back in the 1950s and ‘60s when Ferrari was blowing away the competition at the Autodromo Nazionale Monza, the grueling Formula One track in that ancient city that has long served as home for the Italian Grand Prix. Though modeled after classic race cars, Ferrari claims the SP1 and SP2 will be street legal. It remains uncertain if the cars, sans windshields, will be approved by U.S. regulators, however. They might require some modifications, or the use of helmets. Ferrari hasn’t yet publicly announced a price for the two Monzas, though speculation runs between $2 million and $3 million and could run higher. That’s right in the sweet spot for a new wave of ultra-exclusive “hypercars” that target the 1 percent car collector. Aston Martin is commanding $3.5 million for the 150 Valkyrie models it will build, each making more than 1,000 horsepower. 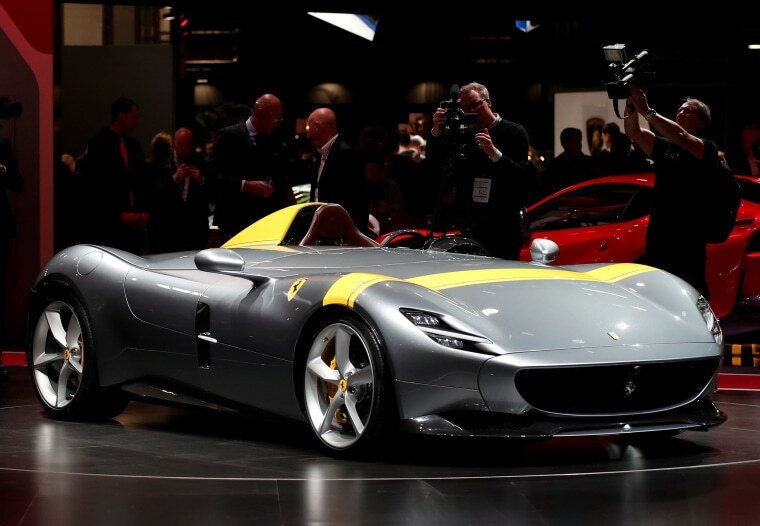 For those with a slightly slimmer wallet, Ferrari also rolled out its latest ragtop at the Paris show. The 50th Spider convertible the company has ever launched will also be its most powerful. The 488 Pista is powered by a 720-horsepower engine that, it claims, will hit 60 in less than 3 seconds. The idea of seeing three new Ferraris debut at a single auto show might come as a shock to some fans, but the exotic carmaker is aiming for a major increase in sales over the next few years, backed by the 15 new models it plans to launch by 2022.